I don’t usually use earrings, but I like to do them. 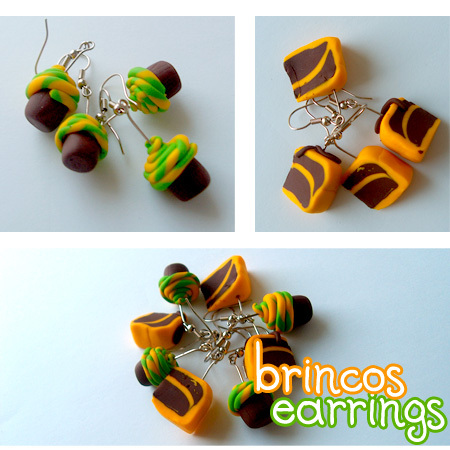 I love to work with polymer clay. Basically I saw a promotion a while ago (that sill exists, don’t know until when) and since it was so cheap I bought lots of colors to keep for later. Eu não costumo usar brincos, mas gosto de os fazer. Adoro trabalhar com pasta fimo. Basicamente vi uma promoção que existiu (e ainda existe, não sei é até quando) em que a pasta fimo estava barata e decidi comprar montes de cores que era para guardar para depois. I don’t think this matters sorry. Sincerely I think they’re not good. I wanted to sell them but if I want to have sucess they’ve to be decent. For now they’ll go for the collection 🙂 Maybe I’ll get better.Isto também não interessa para nada sinceramente. Acho que eles nem ‘tão nada de jeito. Queria vendê-los mas para isso têm de ficar mais decentes. Agora ficam por aí para a colecção 🙂 Pode ser que vá melhorando a minha técnica. Since Saturday I’ve been in Aldeia de Natal (Natal Village), we’re working in a recycled christmas tree. I think it’s starting to look really good. Tomorrow we’re going to finish it 🙂 I’m going to post pictures soon.Desde Sábado, estive na Aldeia de Natal, estamos a trabalhar numa árvore de natal reciclada. Acho que está a começar a ficar bonita. Amanhã vamos acabá-la 🙂 Postarei imagens brevemente. Aww, the earrings are cute! I hope you don’t give up trying to make them. Maybe you will get some money for Christmas so you can practice some more. I would love to see the recycled tree!